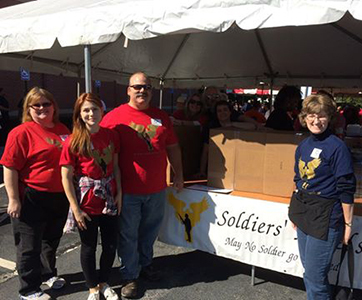 Soldiers' Angels volunteers in Georgia participated in the recent Atlanda Stand Down distributing 700 Boxed Lunches to attending homeless. Stand Downs, sponsored by the VA, take place in cities across the country throughout the year. They provide supplies and services to homeless veterans, such as food, shelter, clothing, health screenings and more. Soldiers' Angels participates in many of these Stand Downs by distributing Boxed Lunches, Hygiene Kits, or other helpful items. Interested in learning more? Click here to learn about all of our Veteran Support Services.